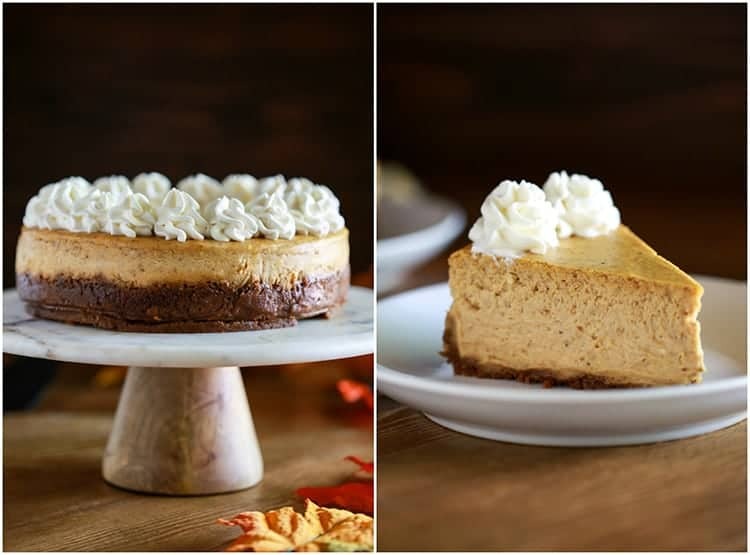 Move over pumpkin pie, because this Pumpkin Cheesecake is ready to impress this holiday season! 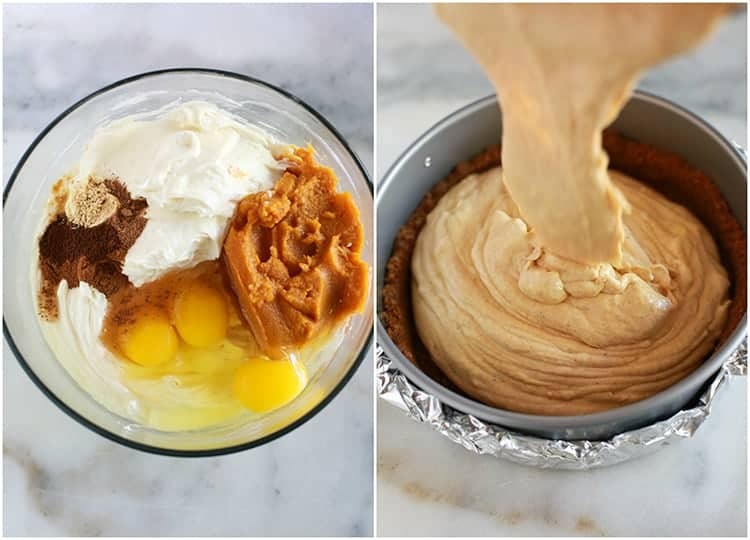 I’m confidant it will become your new favorite pumpkin dessert recipe, and you wont believe how easy it is to make! 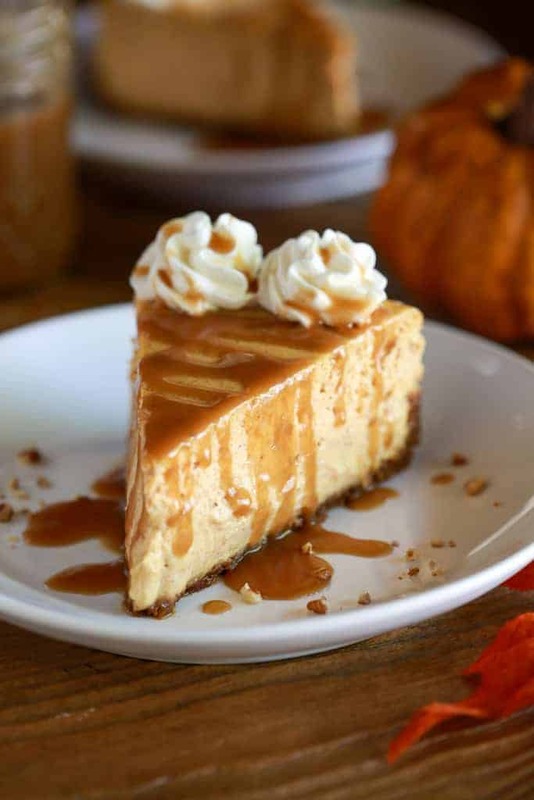 Pumpkin cheesecake with a gingersnap cookie crust, topped with whipped cream and a drizzle of caramel sauce. My first bite of this pumpkin cheesecake was complete heaven! Even with all of the baking I do I still found myself impressed with every bite, impressed that such simple ingredients and a few minutes of my time could make something so delicious and beautiful! I can’t wait for you all to try it! Don’t be intimidated by cooking this cheesecake in a water bath; it’s the easiest method ever! Place the springform pan in a larger pan with water in it, and place the pans in the oven. The humidity and bubbling of the water while it bakes helps the cheesecake cook more evenly and helps prevent cracks in the surface of the cheesecake. Once it’s finished cooking, don’t rush the cooling process! Give it plenty of time to cool on your kitchen counter, and then plenty of time to chill in the fridge before you serve it. This will allow it to set up properly, and you’ll be able to make clean, smooth slices when you serve it. Can I make cheesecake ahead of time, or can I freeze cheesecake? This cheesecake can be made one day in advance. See step 6. You can also freeze cheesecake for up to 2 – 3 months. Here is a great tutorial for freezing cheesecake. Thaw the cheesecake overnight in the refrigerator before serving. Store any leftover cheesecake in the refrigerator. This pumpkin cheesecake really is completely dreamy, and it’s a great recipe for new and novice bakers. 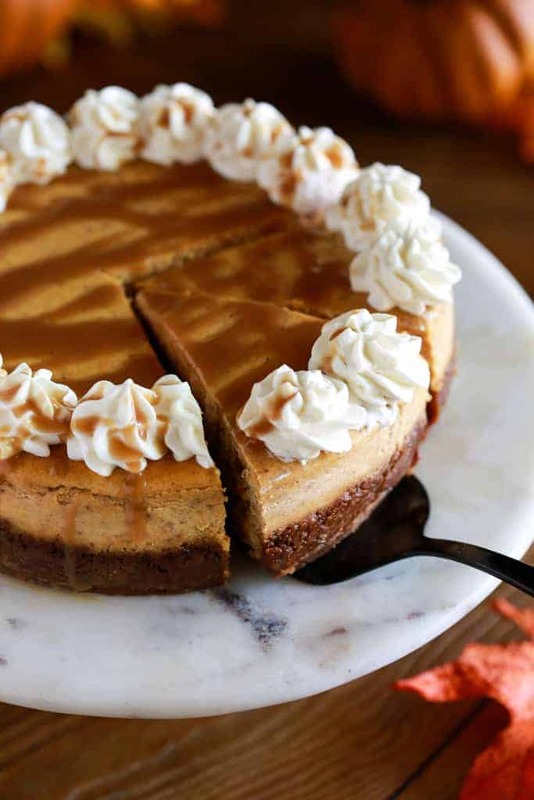 As much as I love pumpkin pie on Thanksgiving, I think this pumpkin cheesecake my rule supreme this year! 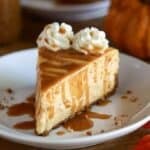 Pumpkin Cheesecake will become your new favorite pumpkin dessert recipe, and you wont believe how easy it is to make! 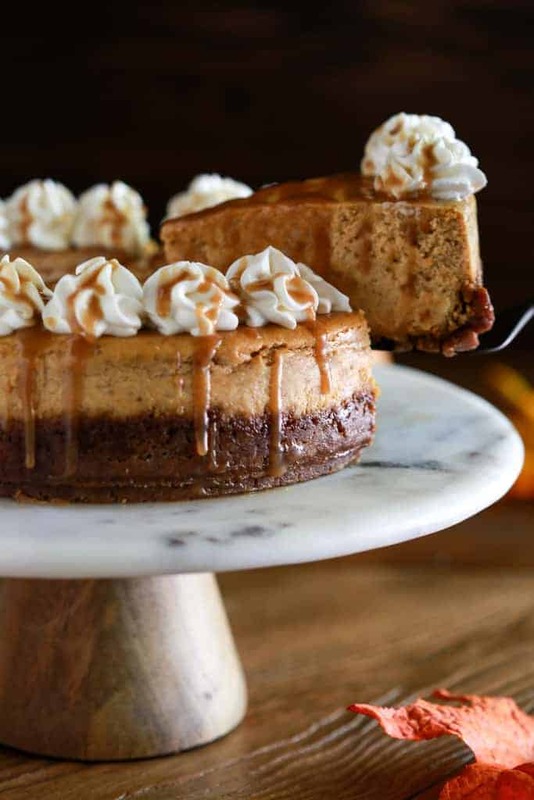 Pumpkin cheesecake with a gingersnap cookie crust, topped with whipped cream and a drizzle of caramel sauce. Cover the outside bottom of an 8-inch springform pan with foil, securing the foil partway up the outer sides of the pan. Press the gingersnap crumb mixture into the bottom and about half way up the sides of the springform pan. In a large mixing bowl combine the cream cheese, sugar, and vanilla and mix with an electric mixer until smooth. Grab a pan that’s larger than the cheesecake pan and fill it with about ½ inch of water, to make a water bath. Place the cheesecake pan inside the dish with the water. My tips for freezing cheesecake or making it ahead of time are above in the post. DELICIOUS! The whole family raved and we will definitely be making this again for Thanksgiving! I love this cheesecake recipe. I’m a beginner so this recipe was very easy to follow. My husband loved it! Making some for Thanksgiving.